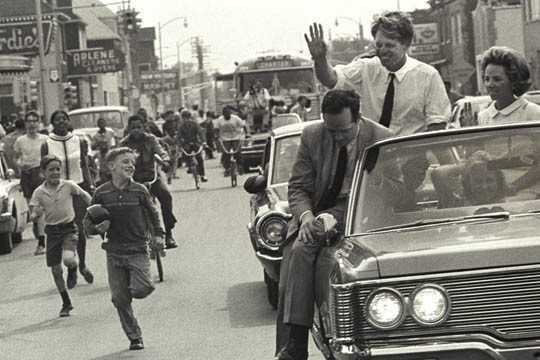 A few years ago Greg Kowalski wrote about the anniversary of Robert Kennedy’s visit to Hamtramck. This year marks the 50th anniversary of that visit. In commemoration of that visit, we are reprinting an updated version of Kowalski’s story. It was 50 years ago that Robert “Bobby” Kennedy drove down Jos. Campau on May 15, greeting thousands of well-wishers and just curious folks who wanted to see the famous member of the Kennedy clan. Four weeks later he was dead, gunned down by assassin Sirhan Sirhan in Los Angeles. Kennedy’s trip to Hamtramck in 1968 elated his supporters. He was in the running for president, and he carried a lot of momentum just by being a Kennedy, the brother of John F. Kennedy who himself had been slain by an assassin five years earlier. And both brothers had visited Hamtramck, John having been here in 1960 shortly before being elected president and again after the election. Bobby only made one trip, but it was memorable in itself. In June, 1968, days after his death, local photographer Tony Tenerowicz, who had photographed John and Bobby during their visits, recalled Bobby’s quick trip through town. Those who met with Kennedy said he was in good spirits as he rode down Jos. Campau, where thousands of people lined the streets. Kennedy had come to Hamtramck after speaking at a youth rally in downtown Detroit. He also toured Detroit’s 12th Street area, where the riot had erupted less than a year earlier. Because of heavy traffic Kennedy was late in arriving at Hamtramck. Mayor Joseph Grzecki and Councilmen Eugene Pluto and Edward Kondrat were parked at the railroad tracks at Caniff for 90 minutes waiting for Kennedy to arrive. It was an unusually hot day, and the wait became increasingly uncomfortable. Workers from the nearby Celanese plant, who were lined up along Caniff, began to give up and leave. Finally a worker from the plant brought out a tray full of cups of water. When Kennedy did appear, Grzecki was hustled into Kennedy’s car, and they sped into the city. The ride through town was fairly quick, culminating at a big gathering at the Dodge Main plant before Kennedy left for the airport and the next campaign stop. Bobby Kennedy was just one of a host of presidents and politicians who have visited Hamtramck through the years. Presidents Roosevelt, Truman, Kennedy, Bush Sr., Clinton and Reagan (just before he was elected) all came to Hamtramck. So did such political leaders as Hubert Humphrey, Thomas “Tip” O’Neill, Edmund Muskie, Michael Dukakis, Adlai Stevenson and many more. But the visits by both Kennedys were special. Perhaps it was because both men were so legendary and their lives ended so tragically. The city was stunned after both Kennedys were shot but Bobby’s death carried a special impact, as he had just been in Hamtramck. You can learn more about Hamtramck’s history at the Hamtramck Historical Museum, 9525 Jos. Campau. Hours are 11 a.m. to 4 p.m. Saturday and Sunday and by appointment. Call (313) 893-5027.